Human beings originated in Africa. The evidence: Most hominid fossils are found only in Africa, and for those species with a wider distribution, the oldest specimens are always found in Africa. In addition, humans' most closely related living relative (both genetically and as placed on the tree of life; refer to Figure 16-1), the chimpanzee, lives in Africa. Not enough to convince you? The existing genetic variation in the human population provides another line of evidence. According to the concept of coalescence, all the genes in a given population have a single common ancestor — some individual in the past from whom they are all descended. Coalescence is the result of random processes whereby some individuals leave descendents and others don't (refer to Chapter 6). Think of families in which different members have had different numbers of children. Perhaps one sibling has no children, and another sibling has many. 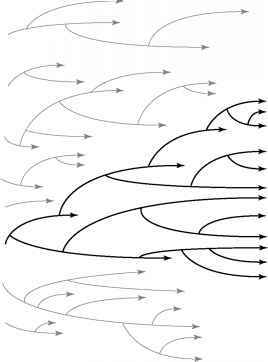 In this way, random forces pile up through time. After enough time has passed, with some members having children and others not, eventually all the existing individuals will be descended from one ancestor. Scientists have discovered that this is essentially what happened, and they dubbed this common ancestor, because she is the one woman from whom all humans descended, "Mitochondrial Eve." Coalescence doesn't mean that if you go back far enough, you find only one individual who started the whole population ball rolling. What it means is that only one individual, out of however many existed initially, has any descendents left. Figure 16-3 shows a graphical representation of this process. Time progresses horizontally, from left to right. At the left are eight initial lineages, but as you go forward in time, more and more of these lineages die out due to random events until, in the end, all the current individuals are descendents of just one of the initial eight. Looking backward in time, you can see how the final lineages coalesce to a single ancestor in the past. As lineages die out, individuals become descendents of one individual. First Africa, then the World! 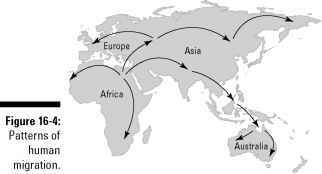 1 Humans probably originated in and spread through Africa first, with a small group leaving Africa and colonizing the rest of the world, although some scientists disagree about whether a single group left Africa and colonized the rest of the world or whether two different periods of emigration from Africa occurred. 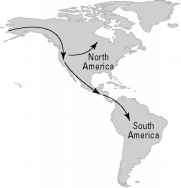 Figure 16-4 shows a map of the Earth with arrows indicating the patterns of human migration. The name "Mitochondrial Eve" was never meant to be provocative, but unfortunately, most people focus on the "Eve" part (which is merely an allusion to the biblical Eve and not meant to imply that there was only a single woman on the planet) and completely skip over the "Mitochondrial" part, which is really the most important part of the name. Mitochondrial DNA, which remains intact through the female line, makes it possible to identify ancestors all the way back through time. The same is true for the Y- chromosome, which remains intact through the male line. To understand mitochondrial DNA and Y-chromosomes, start by thinking about how you'd create a genealogy of your ancestors. You'd get a piece of paper, write your name down, then draw a couple of lines from you to your parents, draw a couple of lines from each parent to their parents (your grandparents), and so on and so forth until you went as far back as you could go. Now think about your DNA. You got half of your DNA from each of your parents, who each gave you one set out the two sets of chromosomes you have. So they each gave you half of their own DNA, but because chromosomes break and rejoin during the process of gamete formation, the DNA you got from each parent was a mixture of the DNA they got from each of their parents. Which is why one quarter of your DNA came from each grandparent, one eighth came from each great grandparent, and so on and so forth. Now from the genealogical point of view for any given bit of DNA in your genome, it's not really possible to tell which of your great-great-great-grandparents that bit of your DNA came from — with two exceptions: your mitochondrial DNA and, if you're male, your Y-chromosome DNA as well. That's because these two kinds of DNA don't get scrambled every generation. You got your mitochondrial DNA from your mother; she got it from her mother, who got it from her mother, and so on all the way back down the line. All of a sudden, you (or scientists who trace lineages through mitochondrial DNA) can go back in time from one mother to the next. Through mitochondrial DNA, a lineage can be traced through the maternal line. The same thing is true of the Y-chromosome. Because in males it pairs up with the X-chromosome and they're different, it doesn't do any recombining. (X-chromosomes do recombine when they're in women, because women have two of them; men only have one). In males, the Y-chromosome never has a partner for recombination. If you're a man, you got your Y-chromosome from your father, who got it from his father, and so on and so forth. Scientists can trace the Y-chromosome back through the male lineage. And that's why these are the bits of ancestral information we can get from our DNA. Recombination doesn't happen with mitochondrial DNA or Y-chromosomes, but mutations can happen, and these accumulate through time — most are probably neutral because good mutations are rare and bad ones get weeded out — in different lineages. By studying these mutations, scientists can say which of us are more closely related. If you and I had a nearly identical mitochondrial genome, we would've had a most recent common great-great-great-great-etc. grandmother more recently than someone who's mitochondrial DNA was a little bit more different than ours. Apply this bit of knowledge to all the people on earth. The more mitochondrial DNA diversity we have, the more we've all been diverging from a common mother (called Mitochondrial Eve) — and that's the information we use to figure out how long ago that woman existed. The deep branches of the tree suggests that our most common recent female ancestor lived in Africa a couple of hundred thousand years ago. Although the primary focus of this chapter is the evolutionary origin of the human species, human evolution didn't stop at the moment of speciation. Humans are still evolving. The following sections discuss some of the evolutionary events that have happened since the origin of our species.